Believe in The Hard Way. Gotta love reporters that don’t fact check. The annual "Toledo has the best recruiting class" write-up is as predictable as the sunrise. Meanwhile NIU will win the West and go to the MACC. As I have said before, Wisconsin and kids from the Chicago do not get the exposure. Wisconsin and Minnesota have one D1 program. Many kids from Chicago can not afford to camp all over the country. Another recruiting trophy for Toledo. Toledo's graduating 2018 Sr's recruiting class(Fr and RFr) were ranked 4th and 3rd in the MAC. Rockets have been #1 only the past 3 seasons, since Candle redshirts a lot of players they're starting to come into RFr, Soph, and Jr seasons. The hard way seems to be working for you guys. I am very envious about that. But what I don't understand is the sheer lack of support behind the football team. I don't think any other winning program has had such a "hard" time putting fans in the seats then NIU. Many of us don't understand it either. But with shrinking enrollment, partly due to state budget issues, that's part of it. Too many weeknight games also - DeKalb only has 40,000 people, everyone else has to travel from Chicago or the suburbs. As someone who lives in the Toledo area, the number of people within an easy 20 minute drive is close to 600,000. It is possible to get off work at regular time go home and make it to the Glass bowl with time to spare. Not so in Dekalb. Additionally there is a fair amount of corporate support locally. I know of people who have gone to games at UM or OSU and then made a night game at UT. I have been to games at UT where the student support is near zero and to others great so it is not a perfect situation. The only other MAC teams that have a similar potential client base are Akron and Buffalo and they have attendance issues too. As a comparison you have BG which is very similar to NIU in terms of town and student population and their attendance is horrendous, at least for football, even though there are plenty of BG alumni in the Toledo area. As an aside, I gave my tickets(including parking, HAF tent and Coaches club) to my nephew/niece's schools auction last year (in Naperville) and the people who went to the game, IIRC they went to homecoming said they had a blast and would definitely go to another game. So the game experience is good to great you just have to get the people out and that's where the midweek games hurt the most. Us diehards will go to midweek games but it's hard to get friends/relatives/fellow alumni to come with, so you miss out on the multiplier effect. I also think its due to alumni not feeling connected to the university. They graduate and move on without looking back. The current study body seems to already have this lack of connection (partially due to suitcase students). No school pride? I started at NIU in '93 and it was a suitcase college then (as I'm sure it was for decades prior). And that "status" definitely hurts the student support of all sports. Nevertheless, I live in the Western suburbs but work near Midway Airport. I get up at 5:15 am every work day. Getting out to DeKalb for a weeknight game (football or basketball) is a real challenge. I can make it out there for a 7 o'clock game but that gets me home really late for football games. Basketball is a little more manageable. I talked to my colleague about coming out but he lives in Englewood and for him to get home from a basketball game is a real chore. Basically, week night games don't happen for me and the weekend games are like once a season for each sport if the timing and weather work out. In terms of offensive skilled positions yes ,Toledo is leaving NIU in the dust. (02-11-2019 08:14 PM)MaddDawgz02 Wrote: In terms of offensive skilled positions yes ,Toledo is leaving NIU in the dust. 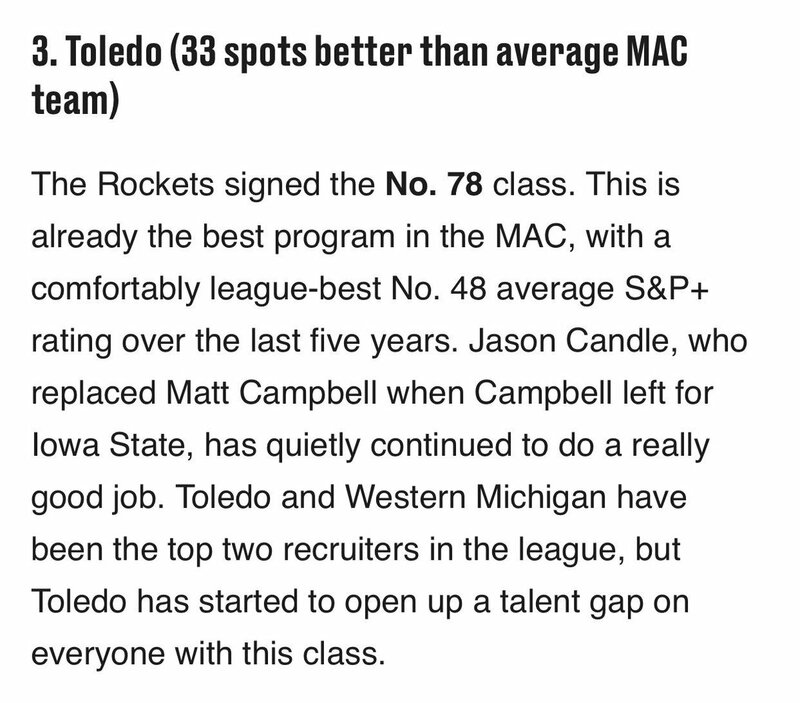 Death, taxes, and Toledo recruiting class ranked #1 and MAC media picking Toledo to win division.